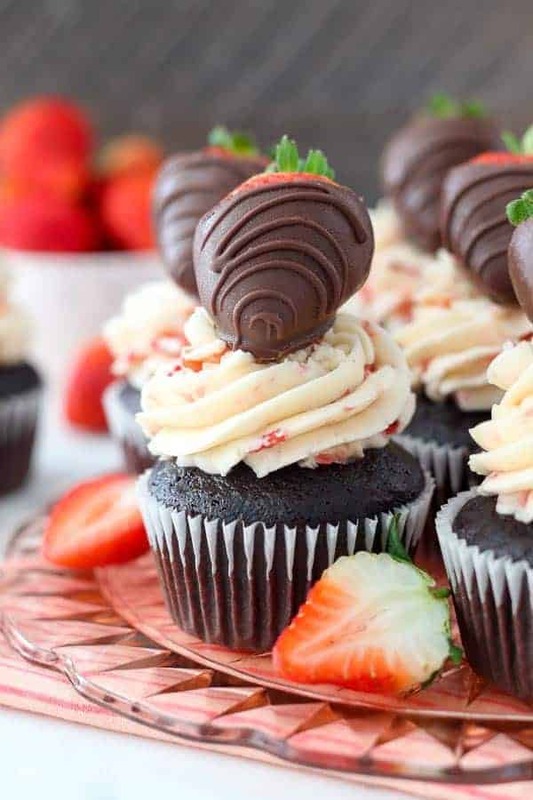 These Chocolate and Strawberries Cupcakes are homemade moist chocolate cupcakes covered with a fresh strawberry Swiss meringue buttercream and topped with a chocolate covered strawberries. I am pulling this recipe out of the archives and giving it a facelift. The original reason I made these cupcakes is because my boyfriend husband did a road trip to Lake Tahoe, it was at least 10 hours each way. Randomly on the side of the highway we spotted a Ghirardelli chocolate outlet. I was quite excited. I’ve completely obsessed with my moist chocolate cupcake recipe, so as I go back and update all recipes, I’ve been remaking them with my homemade chocolate cupcake recipe. 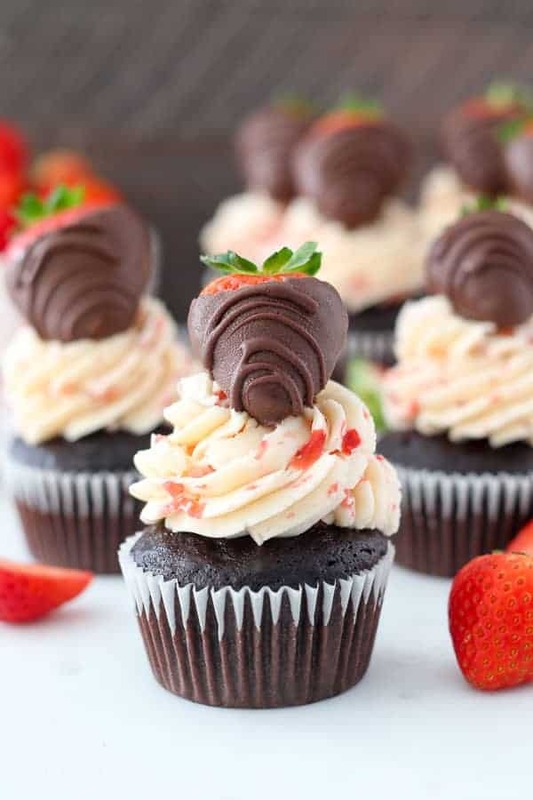 Whether it’s Valentine’s Day, a birthday or for no other reason than you simple need to make some cupcakes, these Chocolate and Strawberries Cupcakes are perfect for the occasion. 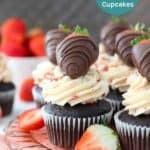 The chocolate cupcake is topped with a strawberry Swiss meringue buttercream and topped with a chocolate covered strawberry. The cupcake is a light and fluffy, moist but not overly sweet. 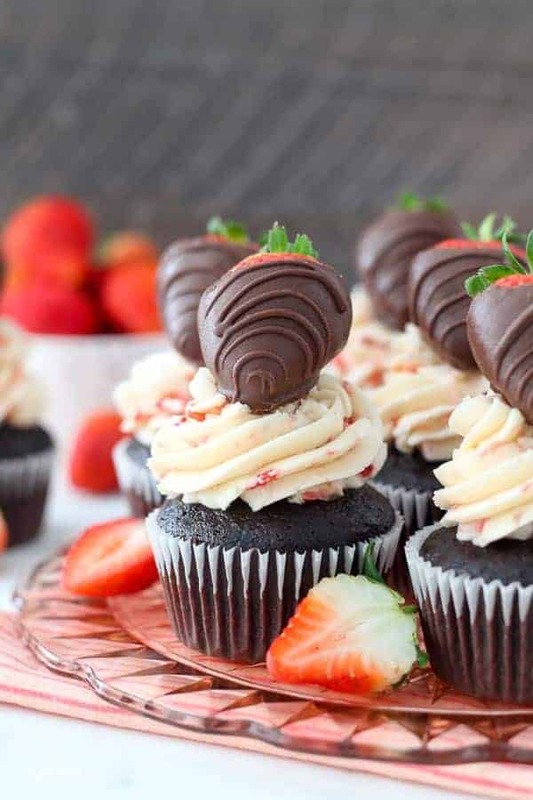 I just love chocolate covered strawberries. Actually, most fruit covered in chocolate tends to be pretty awesome, but I’ll never turn down a chocolate covered strawberry. 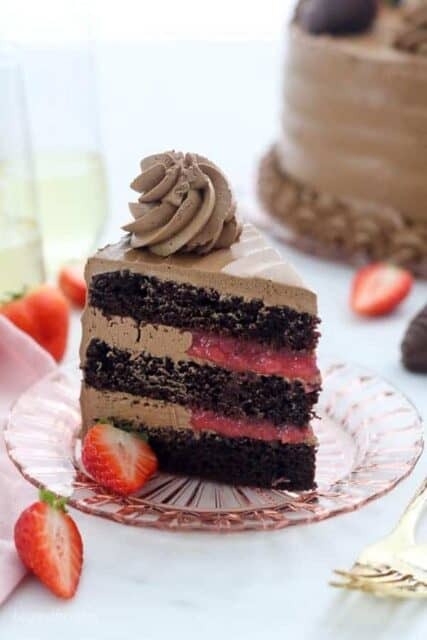 Do you really need me to convince you to eat a chocolate and strawberry flavored dessert? I hope not! It’s also made with brewed coffee. A lot of people ask if you can taste the coffee, and the answer is no. The coffee helps bring out the chocolate flavors. If you’re really opposed to it, you can use hot water or milk in place of the coffee. If you’ve never made a Swiss meringue buttercream before, you’re in for a real treat. This type of frosting is made by heating egg whites with granulated sugar and then whipping them into a meringue. Once the butter and flavoring is added, it results in a silky, very light frosting. It tends to be a lot less sweet than traditional American buttercream. With the addition of the strawberries, the Swiss meringue buttercream take on a whole new aesthetic. Right away you’ll notice there’s only a subtle flavor, but as the frosting sets, the flavors really absorb. I actually think it’s best served on the next day. I’ve found that a lot of people haven’t made Swiss Meringue Buttercream before because it just a less common frosting to make. So, I took the time to detail all the steps, and my tips and tricks when it coming to making this buttercream. I highly, highly recommend giving that a read through before you start to make this frosting. I want to be sure you’re successful! Specifically, for the strawberry version, I recommend pulsing the strawberries in a food processor, leaving you about half puree and half small diced pieces of strawberries. It gives you a little bit of texture in the frosting and ensure that you won’t overdo it with the liquid. 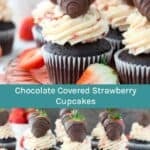 I’ve used this strawberry Swiss meringue buttercream or cookies and layer cakes and it pairs really nicely with vanilla cupcakes as well. 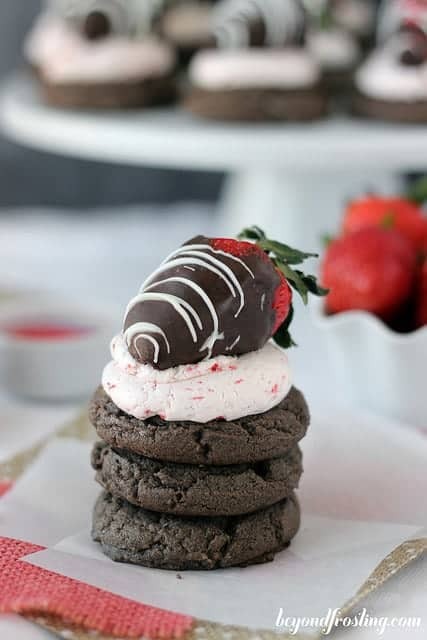 Now it’s up to you if you’d like to add the chocolate covered strawberry but they are so dang pretty and obviously add a little wow factor. If you’re serving these rights away, then go ahead and place the strawberry on top, but if you’re preparing them in advance, then it might be best to leave the strawberry off to the side. 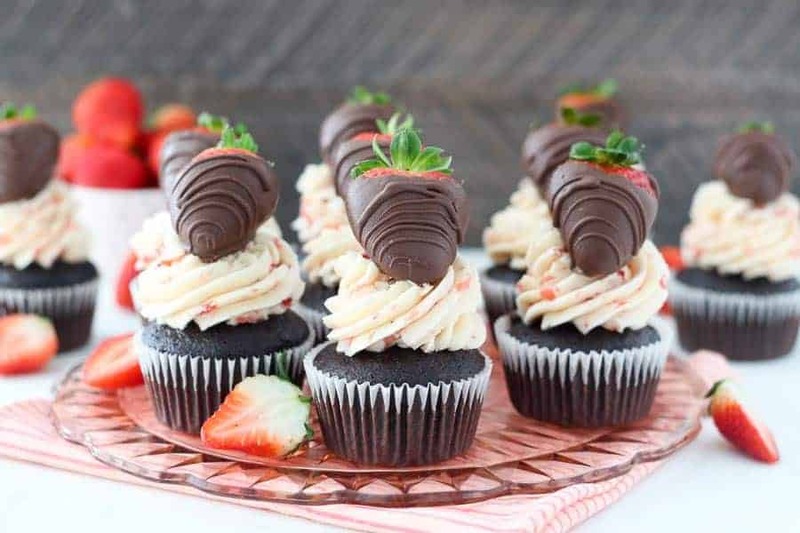 After the first day, chocolate covered strawberries tend to “sweat” on the outside, so I don’t like to leave them on top of the cupcakes for too long. Let’s run through some quick tips. For the chocolate, use chocolate wafers that are meant for candy making. My favorite is from Ghirardelli. 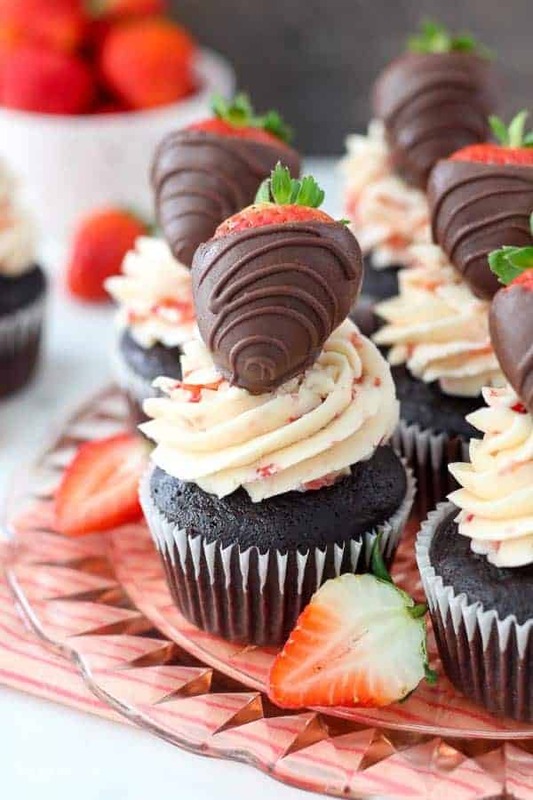 6 ounces of melted chocolate will make 18 strawberries. 8 ounces is probably enough for 24. 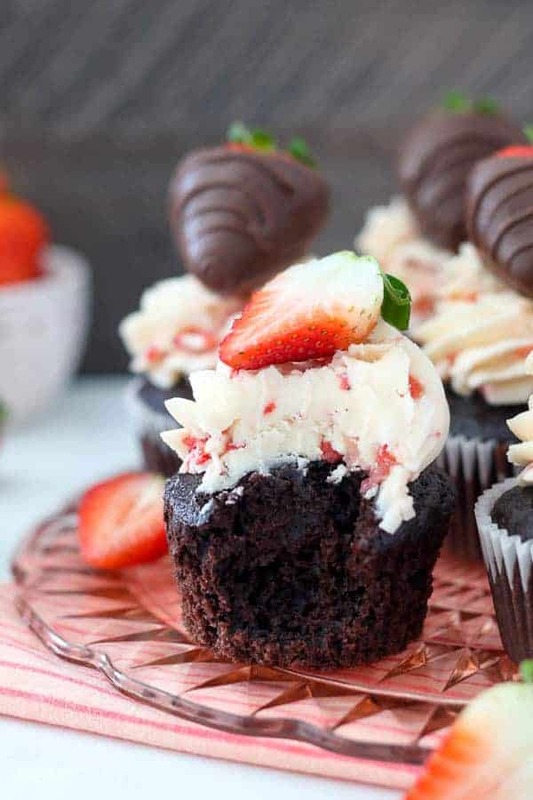 Don’t wait around for an excuse to make these Chocolate and Strawberry Cupcakes! For the cupcakes: Preheat the oven to 350°F. Line a cupcake pan with cupcake liners. Using a large cookie scoop, divide the batter evenly, filling each liner 2/3 full. Set your bowl over top of a pot with water, just enough to cover the bottom of the pot (about 1 ¼ cup). You do not want the water to boil and touch the bottom of your mixing bowl. Heat the water on medium to medium-low heat. Combine the sugar and egg whites and stir (using your greaseproof spatula) constantly until the mixture reaches 140°-160° F. This is the most important part; you do not want to egg whites to cook. When it reaches 140° F, the sugar should be dissolved in the egg whites. You can test this by placing a drop on your fingertips and rubbing them together. The mixture should be completely smooth. Remove from heat. After 5 minutes, increase the speed to high. You will notice that as you increase the speed, the body of your meringue will also increase. It will start to look glossy as the peaks begin to form. Beat for another few minutes. After about 10-12 minutes the bottom of your mixing bowl should be cooled completely. Your SMB should look kind of like whipped cream. Scrape down all sides and bottom of the bowl. Switch to the paddle attachment and continue beating on medium to allow all the air bubbles to escape. In about 3-5 minutes the frosting should be smooth. If your frosting appears to be curdled, just keep beating. Lastly, pour in the strawberry puree and beat for another minute or two until they are well combined in the frosting. 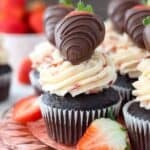 Pipe onto cooled cupcakes with a large open star tip or open round tip. If serving immediately, place the strawberry on top. Be sure to check all my tips for Swiss Meringue Buttercream. Hi, will the frosting separate? I’m looking for a strawberry swiss meringue buttercream as a macaron filling. Thanks! Hi Dana, this frosting did not separate for me, but I am not familiar with macaroons, so I cannot say with certainty if this would work well for macarons.